Traders in a Moray town claim their summer season has been wrecked – by a set of bollards. Residents in Lossiemouth were left furious earlier this year when the local harbour board decided to block off an access road without warning. Port chiefs said the decision was taken on safety grounds – but business owners said last night the move had hit their takings and had actually created a hazard. And they have enlisted the help of Moray MSP and Scottish Government minister Richard Lochhead in their battle to persuade harbour bosses to remove the obstacles. The bollards – and signs which say “No Access” and “Residents Only” – were erected in February at either end of the lane which links the west and east sides of the harbour. Mr Lochhead, who is environment secretary, held talks yesterday with concerned traders and vowed to raise their concerns with the harbour authorities. The SNP politician said: “I’m taken aback by the lack of consultation there was before the bollards were installed. “However well-intentioned the Lossiemouth Harbour Board was, there is no doubt the signs and bollards send out the completely wrong message at a time we should be more welcoming to visitors and tourists. “Our ports and harbours around Scotland are making themselves as attractive as possible. Residents say less drastic measures – such as 5mph signs, a one-way system, speed humps or single track route – could have the same effect as the bollards without blocking access. Owner of Lossiemouth’s Harbour Lights restaurant, Evelyn Thomson, said: “Summer is usually a busy time but, because of the bollards, we haven’t had as many customers this year. She added: “They put the bollards in for safety, but delivery lorries and bin lorries have to reverse back up the road when they reach them. Owner of the Shore Street petrol station, John Thomson, has led the crusade against the obstruction – and a petition he launched has attracted the backing of 26,000 supporters. He said: “We’re just dying a slow death in Lossiemouth, it is killing the harbour. Resident Lydia Davis, however, welcomed the development. 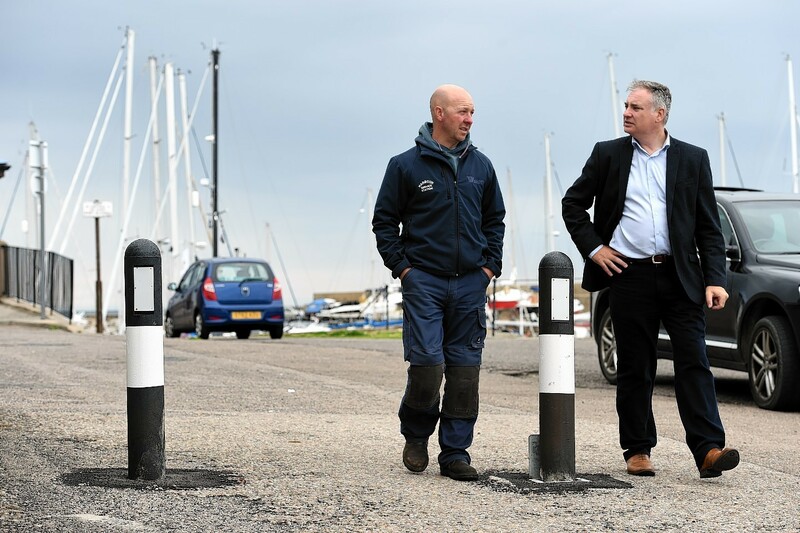 Lossiemouth Harbour Board director George Reid stressed the bollards were put in place primarily as a safety measure, but declined to comment on Mr Lochhead’s request for them to be removed. He said last night: “The bollards were installed to benefit the town, and they have eliminated any risk of traffic accidents at that area. One objector to the roadblock took matters into his own hands earlier this year when he hacked one of the bollards from its mounting with a saw and hurled it into the harbour. Opponents of the obstruction were quick to condemn the vandalism, and Mr Reid said the man was “probably a wee bit drunk”. Police said yesterday that inquiries into the incident were ongoing.